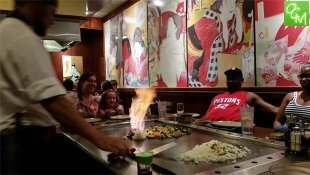 Miyako Great Lakes Crossing Japanese Steakhouse Review – Pics, hours, and menu info. Miyako is a hibachi style restaurant that is family-friendly, and serves Japanese entrees fired up at tabletop grills, plus sushi and cocktails. Miyako Japanese Restaurant is located near Entrance 6 in Great Lakes Crossing in Auburn Hills MI.